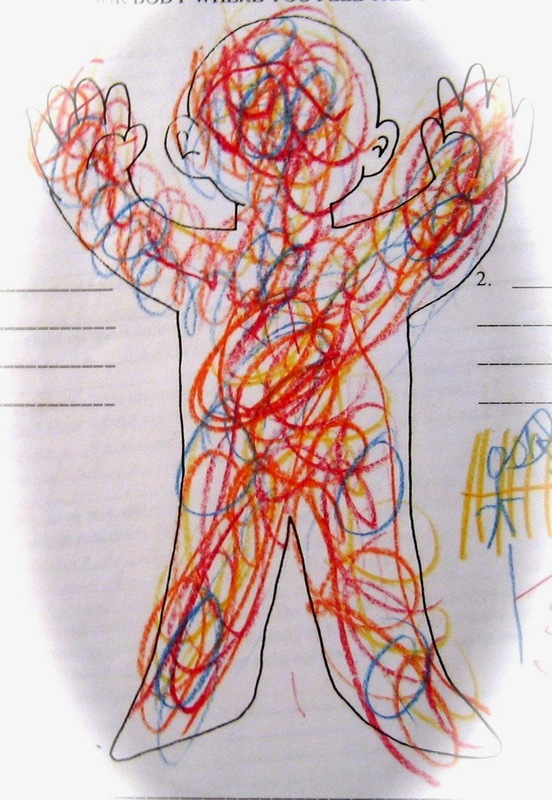 A child's drawing of how she feels when she is surprised. I do Art and Play Therapy with children who have moved many, many times to new foster homes. With each move there are new setbacks, new fears, new traumas, and new issues for child to struggle with. Sometimes the move to a new environment happens as a complete surprise to the child and sometimes what a Social Worker describes as going for drive ends up being arriving at a new home for a very startled and shocked child. So, it is any wonder that small and large surprises, moves or changes would trigger traumatic memories or fears? Even those of us who have not moved seven or eight times in our lifetime, find moving traumatic or at least tough. Having your own space, room, or home helps create the environment within a sense of grounding and belonging can take root and grow. Always moving, means that space has to be nurtured inside oneself. It is hard to trust others or the world if it cannot also be grown outside oneself. And it cannot be grown at all if the body is constant flight-or-fight response. When any unexpected event happens, we all experience levels varying levels of fear, surprise, or shock. The children I work with have had their fight-or-flight response activated so many times that it becomes a habitual state to live in one or the other. A startle response which is a brief mental and physiological state of surprise or not knowing in response to a small surprise or change, moves quickly into high end flight reaction (dissociation) or fight (aggression). Moving to a new classroom, new bedroom, having a new eating place at the dinner table, etc. all trigger the trauma response without the child knowing why. But it is our responsibility as adults to know why and to create the safety and containment that child in our care needs. When the rules of reality dictating everyday life are always changing, as where you live, who you call Mom, and what the day to day rules are, how can a child achieve self-regulation? So if a foster child is in your classroom, home, or therapy room understand why surprises are not always good for this child. Routine is important, change is frightening and needs to be clearly explained. Being consistent with your child makes them feel safe and wanted. Watch your child for signs of activation; raised eyebrows, wrinkles in forehead, dilated pupils, dropped jaw, darting eyes, shallow breathing, tightening in the upper body, or a darting or running response. These involuntary bodily responses often displayed for a fraction of a second may be followed by confusion, fear, or anger. Explain to them what is happening and why. Offer them ways to de-escalate as, to do some deep breathing, drink a glass of water, do some movement or release the energy in a way that works for the child. Later doing art expressing feelings would be a good idea. When children regain control and body awareness, then they are not triggered by small changes that remind them unconsciously or consciously if the big life changes that they have experienced. The fear, anger and frustration that the child now feels transforms into grounded awareness and self-regulation. The flight or fight response decreases and the child can move safety and confidently through the world. Haven't seen your posts in a while. This is a good one. As always, a thoughtful post for us to consider. Sometimes any child, even those not in foster care, can have responses based on their life experiences thus far. Too many children live in homes where the inconsistency and traumas can trigger fight, flight or freeze. Thank-you for your thoughtful and informative site! I have sent it to others who may be interested.